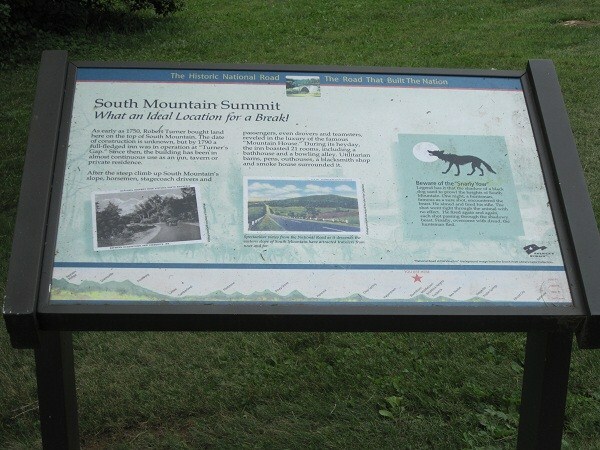 The Snarly Yow is a mysterious giant black dog, who has been sighted at various spots on South Mountain, Maryland. His territory appears to be at a pass in where the old National road cuts across a brook and canyon. Although his appearance is similar to the “black Shuck” of the UK, this hounds appears to not have a connection to the imminent death associated with many other hounds. Eye witnesses claim his coat changes from white to black. One sighting described Snarly as a white headless dog which dragged a chain. horses and disappear as the rider was thrown from the horse. his family, he encountered the Black Dog. upon it, the sinewy arm of the woodsman met with no resistance, but rather seemed to beat the air. There were also many in the 20th Century, apparently due to The Snarly Yow's fondness for chasing cars. The common current story is the hound attempt to block cars on the road. He will appear so lifelike that drivers on the National Road (Rt 40) will actually think they hit a dog. When they stop and see what happened Snarly will be there with teeth barred, then just disappear. "Beware of the “Snarly Yow.” Legend has it that the shadow of a black dog used to prowl the heights of South Mountain. One night, a huntsman, famous as a sure shot, encountered the beast. He aimed and fired his rifle. The shot went right through the animal with no effect. He fired again and again, each shot passing through the shadowy beast. Finally overcome with dread, the huntsman fled."